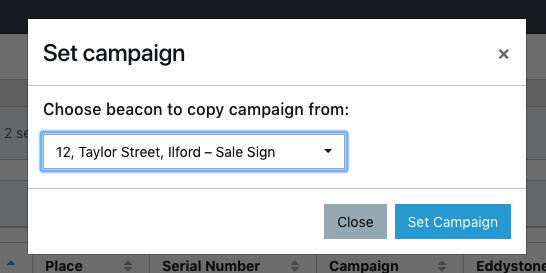 Bulk operations make repetitive tasks like setting place, updating campaigns for multiple beacons easier. Select all the beacons that you want to update. 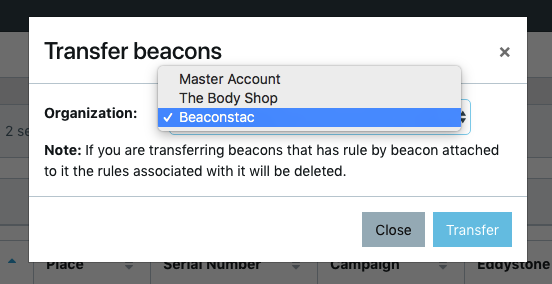 Select a Beacon whose campaign you want to copy over (The Campaign from that beacon will be copied to all the selected beacons) and click on Set campaign. Select Assign place from the Bulk operations dropdown. Select the required place from the list and click on Assign place button. Select the beacons that you wish to transfer to a different organization. Select Transfer beacon from the Bulk operations dropdown. Select the required place from the list and click on Transfer button.